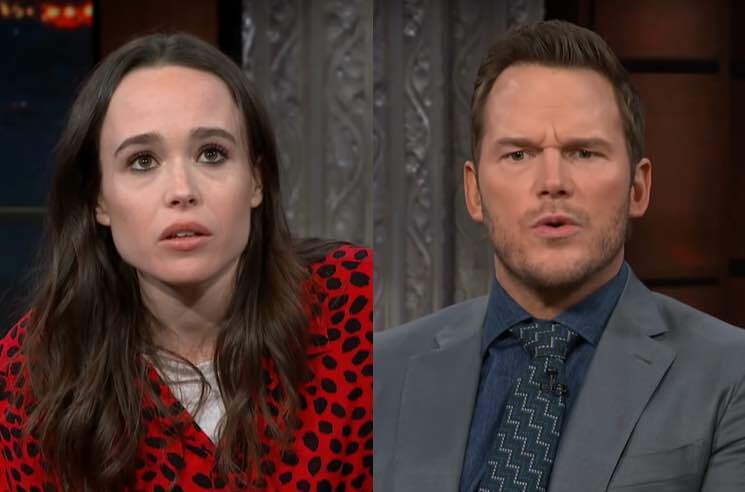 Last week, Canadian actress Ellen Page called out Chris Pratt for promoting his "infamously anti-LGBTQ" church on The Late Show with Stephen Colbert. Now, the Guardians of the Galaxy actor has responded to her claims. Pratt took to his Instagram story to address the allegations that the Hillsong Church, which he belongs to, discriminates against the LGBTQ community. "It has recently been suggested that I belong to a church which 'hates a certain group of people' and is 'infamously anti-LGBTQ," he wrote. "Nothing could be further from the truth. I go to a church that opens their doors to absolutely everyone." Pratt went on to say that he has been accepted with open arms, despite the Bible's teachings on divorce, with members "gracefully accompanying me on my walk" and "offering love and support." Pratt continued to say that while his church is important to him, it doesn't define him, and he is not an official spokesperson for Hillsong. "My values define who I am," he concluded. "We need less hate in this world, not more. I am a man who believes that everyone is entitled to love who they want free from the judgement of their fellow man." Despite Pratt's claims of the church welcoming everyone, Hillsong released a statement in 2015 saying that, "We do not affirm a gay lifestyle" and maintained that marriage is to be a union between a man and a woman. See a screenshot of Pratt's Instagram story below.